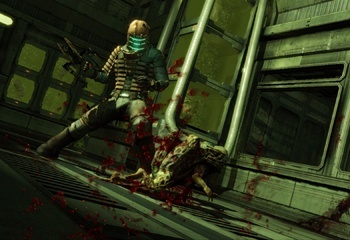 Bad news, PC gamers: It looks like there will be no Dead Space 2 for you! EA's third quarter results for the fiscal year 2010 are about what you'd expect: Lots of numbers, talk about things like non-GAAP net revenues, upbeat sound bites from various executives and all in all, as the saying goes, dull as dirt. But there is one bit of information that's of interest to more than just accountants and analysts: Way down near the bottom is the list of EA's "key titles" for the 2011 fiscal year, included among them Dead Space 2; and Dead Space 2, according to that list, is being released for consoles and generically-defined "handhelds," but not the PC. Optimists might think it's a misprint - perhaps the check mark was accidentally placed under handhelds instead of PC - but EA's public relations department told Blue's News that, "As of right now a PC sku is not in the plan." Could it be coming later, similar to the PC launch for Mass Effect, which followed six months after it hit on the Xbox 360? We've reached out to EA ourselves for clarification and will update when we hear back. For now, however, it looks like once again, Team PC is going to go without. UPDATE: Electronic Arts has issued a statement in response to queries about the fate of the game on the PC. "Visceral Studios is dedicated to delivering an outstanding Dead Space sequel for the Xbox 360 and PS3," said EA public relations rep Melissa Ojeda. "A PC SKU is under consideration. Nothing additional at this time."